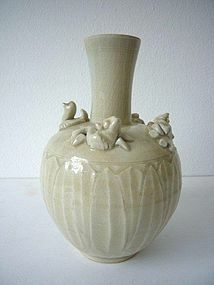 Marvellous Qingbai vase. The lower body with carved lotus petals, the shoulder decorated with four animals, representing the four seasons and the four wind directions. China, Song or Yuan Dynasty, ca. 13th/14th century. H. 19,5 cm. Condition: excellent with crackled glaze and normal age wear.